I’m at Least 0.4% Swiss!! I believe that there are only two spots during the entire four-year diary where Grandma failed to write a daily entry—one place was in January 1911 near the very beginning of the diary; the other spot is here. I will use these days to provide additional background information about Grandma. Today, I’d like to share some genealogical information about the Muffly family. It looks like the Muffly family originally came over from Switzerland. I recently contacted Rootsweb—Northumberland County to try to find out more about the Muffly family. Bill Dietrich responded. He had traced the Muffly paternal line back to Bern Switzerland. Bill-thank you! I organized the information by generation. My cousin Stu Kurtz provided some additional details based upon census data that he found on the Church of Latter Day Saints’ FamilySearch site. Heinrick Muffly (February 15, 1772 – February 4, 1853) and Julia Marie Walker (1774-1861). Heinrick moved from Centre County, Pennsylvania to Montour County Pennsylvania (which was also part of Northumberland County at that time). Samual Muffly (April 21, 1797-July 1, 1873) and Anna Maria Kleppinger (1795-1868). Samual lived in Montour County Pennsylvania. Samuel K. Muffly (December 14, 1827-1896) and Charlette Treon (1827-1905). Samuel K. was born and died in Montour County, Pennsylvania. Note: Stu looked at census data and found many of the names in this generation in the 1870 census—but he did not find Mentures. Mentures apparently died young. Stu says that according to an online dictionary menture means “intellect” or “mind” in Latin. In the 1800s Latin was commonly taught in schools, so maybe a version of the word was used as a name. Albert James Muffly (November 23, 1857- 1949) and Phoebe Jane Derr (1862-1941). Albert was born in Montour County; As an adult lived in Northumberland County. Please note that this list may be revised. We’re still double checking some of the information—but I wanted to share what I had. My son asked what proportion of my ancestry was Swiss. 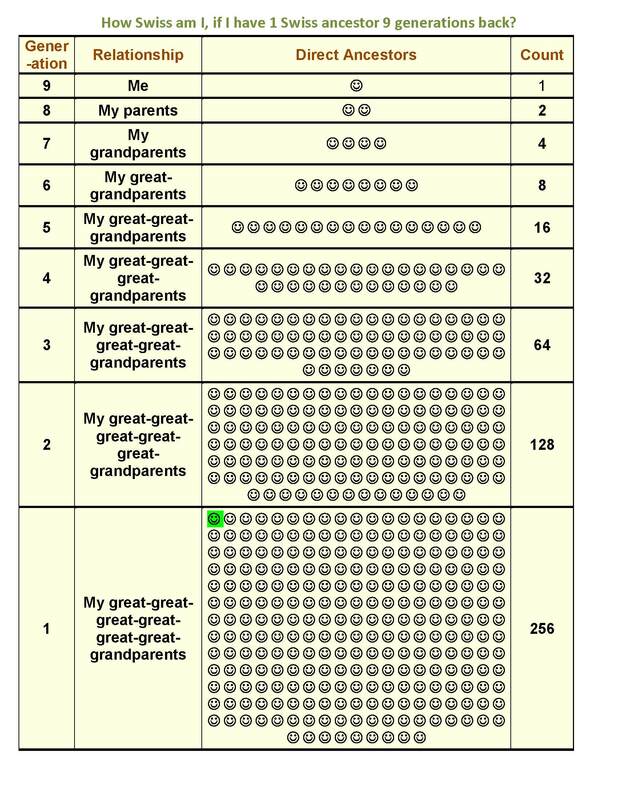 Well, nine generations ago I had 256 great-great-great-great-great-great grandparents. At least 1 of them came from Switzerland, so I’m at least 1 / 256th Swiss—in other words, I’m at least 0.4% Swiss. Posted on April 19, 2011 December 2, 2013 by SherylPosted in GenealogyTagged family history, genealogy. I’m glad you like it. I had a lot of fun trying to figure out how visually present this information.